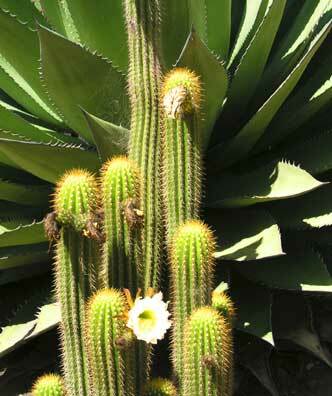 Organ pipe cactus in front of a large succulent. Most of its flowers have bloomed and shriveled. The most obvious purpose for spines is for protection against foragers. The cactus basically asks, "How much pain are you willing to endure to get a drink in this desert?"